CASTLEFORD TIGERS boss Daryl Powell believes Shaun Edwards would be a “good fit” for Wigan Warriors after Shaun Wane’s shock resignation as head coach. To the surprise of many, Wane announced yesterday that he will leave his hometown club at the end of the season for a “new challenge”. Castleford Tigers' head coach Daryl Powell.' Picture Jonathan Gawthorpe. He has won two Grand Finals, a Challenge Cup and a World Club Challenge since being promoted from assistant to replace Michael Maguire ahead of 2013. Edwards, who won every honour in the game with Wigan as a player, has spoken of his desire to return to the sport after a successful career in rugby union with Wasps, Wales and the British Lions. The 51-year-old was a Great Britain team-mate of Powell’s while another ex-Wigan captain Andy Farrell has also been touted as a potential replacement. On Wane, Powell said: “He took over from Michael Maguire, who set a good platform and he’s carried on the Wigan way. If he did want to come back there’s quite a few who have played rugby league to the highest level then coached in rugby union so it would always be good to have those guys back again. “They have a certain way of doing things and I think he’s done a good job there. It will be interesting to see what his next challenge is. “Shaun Edwards has spoken about coming back into rugby league and he’d be a good fit there, certainly from a personality point of view. Powell added: “Shaun Edwards is a rugby league man. I played international rugby with him so I know him reasonably well. He’s done a great job in rugby union. Shaun Edwards celebates collecting his Challenge Cup medal after beating St. Helens in 1991. “If he did want to come back there’s quite a few who have played rugby league to the highest level then coached in rugby union so it would always be good to have those guys back again. 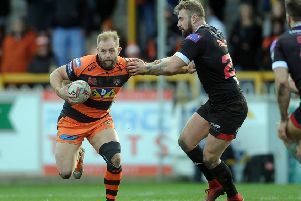 Meanwhile, the Castleford chief hopes to have Samoa stand-off Benny Roberts back from injury to bolster their chances against Super League leaders St Helens on Thursday night. With England scrum-half Luke Gale out with a knee injury, Roberts will give Powell greater experience at half-back. He started the season at full-back but captain Michael Shenton has switched from centre to play No1 recently and seems to be adapting to that role. Shenton impressed in Saturday’s convincing Magic Weekend win over champions Leeds Rhinos - their best performance in 2018 - with teenager Jake Trueman and Jamie Ellis in the halves. Asked about any new injuries, Powell said: I’ve got to check on a couple of guys this week, but I think we’re all right. Potentially Benny Roberts will be okay. He’ll train Wednesday and we’ll go from there. “It’s an interesting one (where he fits in) and it’s pretty competitive. I think Shenny’s been outstanding at full-back, particularly in settling us down. “At the back defensively he’s been great and he’s a steadying influence. With both the wingers he’s been great and I think that’s worked for us.